IDEAL FOR WHATEVER YOU NEED. The T206H Turbo Stationair HD is the piston aircraft that perfectly fits your needs, whether for transportation, leisure, or business. There are countless possibilities at your fingertips. 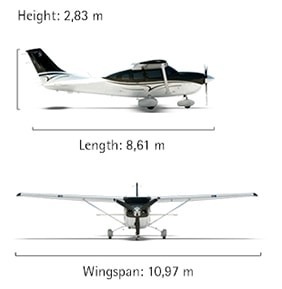 The model has the largest interior space in the Cessna line and one of the largest in the category, and can comfortably carry up to five passengers. Its large cabin can be easily reconfigured, serving the most varied missions. Also available in the utility version for an even larger payload. Take-off, flight, and landing. At all stages, you can count on the maximum safety of the Cessna, powered by Garmin G1000 NXi avionics. The bold design of the T206H Turbo Stationair HD was designed for the aircraft to achieve maximum aerodynamic performance. Details such as LED landing lights and bold lines not only help to bring together the look but also enhance safety and economy. Seat configuration options can be easily adapted into a track system. All passengers have access to lighting, ventilation, and 12-volt power outlet, plus, of course, the luxury provided by Cessna's exquisite finish.